Confirmed unsigned Chanel necklace circa 1960 or 1970; I recently saw this same necklace with a Chanel hang tag with just the name in block lettering (no season numbers or copyright symbols), which dates it to 1970 or prior. I had previously listed this necklace as a probable Chanel. 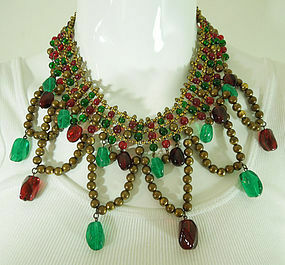 Designed in the Indian moghul style which was one of Chanel's main influences, with red and green Gripoix poured glass beads simulating carved rubies and emeralds, and dark goldtone beaded drops and terminal chains. All elements are wired in the distinctive French style. Spring ring clasp (appears to be a replacement). Wearable length is 16 1/2 inches. Center drop is 4 inches. Excellent condition. Display form is life size. Photos enlarged to show detail.